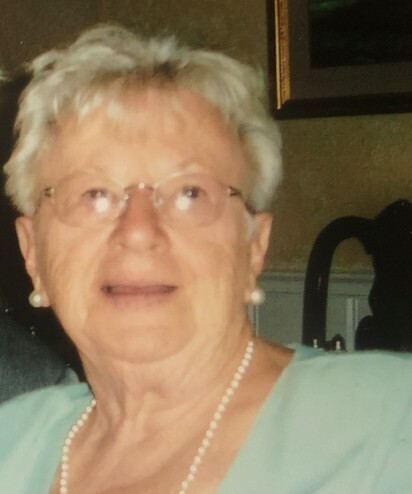 Ann Hanus, age 89, of McMinnville passed away Sunday, March 31, 2019 at Raintree Manor of McMinnville. She was a native of Trieste, Italy. Survivors include a Sister, Albina of Italy; Children, Edward Hanus of New York City, NY, Joe (Christine) Hanus of Cinnaminson of NJ, Linda (Ben) Davidoff of McMinnville, & Thaddeus (Lynda) Hanus of Riverside, NJ; Grandchildren, Jason Cassels, Christopher Smith, Anna Stone, Bennie Davidoff, Christian Davidoff, Derek Davidoff, Elicia Boon, Justin Hanus, Forrest Davidoff, & Daniel Hanus; Great Grandchildren, Autumn, McKenzie, Kirsten, Olivia, Annie, Izabell, Marilyn, Eugene, Brynn, Adelaide, Kaitlyn, Walter, Ellie, Klaira, Emma, & Billy. Numerous nieces & nephews also. Ms. Hanus was preceded in death by her husband of 50+ years, Walter Hanus; her parents, Andrea & Natalia Zocchi Badovini; and 12 siblings. She was a member of St. Catherine’s Catholic Church and was a homemaker. She enjoyed cooking Italian & German food for others and loved spending time with her family where she was affectionately known as Mom-mom.